I am in the process of having master bath remodeled. I noticed after the shower floor was grouted that that the 2" white Carrera hex marble had turned gray. It seemed to get worse after plumber installed showed head and body jets and was testing water. The is a slope in the shower going to the drain, almost feels like your in a small hole, which I thought was kind of weird. Also darkening seems worse at the back of the shower on my right if I was facing shower head. Given that remodel is still in progress these tiles have not been sealed and I will tell you the tile guys did awful job with the grouting. Right now I have some of surplus in water to see if it turns gray. Marble is a poor choice for wet areas. Many times there will be discoloration once water is introduced. There's two issues: the marble getting dark and the way the shower is built. In regards to the marble darkening this is just what's going to happen. If you don't want dark marble then you'll have to go with a porcelain tile that looks like marble. The way your shower is built is cause for concern. The bottom where the liner goes into the wall isn't correct. Also, where it wraps into the curb is probably the most alarming. This thread in the Liberry is a good resource on shower construction. It's wise to bring up the issues with the general contractor and let them know that you want your shower built correctly to industry specifications. It might be wise to change your shower pan tile in the process. Visit Tiger Mountain Tile Inc's homepage! Thank you for your response. Can you explain further when you are talking about the shower membrane being most alarming over curb. Will this now be a potential for water leak or drainage issues. The bathroom floor tiles run right to the edge of the shower, which is fine. But it looks like they stuck half of the tile to the concrete slab and the other half to the pan liner. Not sure that's what they did but they may have. Also, what did they stick the tiles to on the inside of the drop down, between the edge of the step down and the shower floor? You're not supposed to stick tiles directly to a PVC pan liner. I like seeing the glue on pan corners and I'm not seeing them. 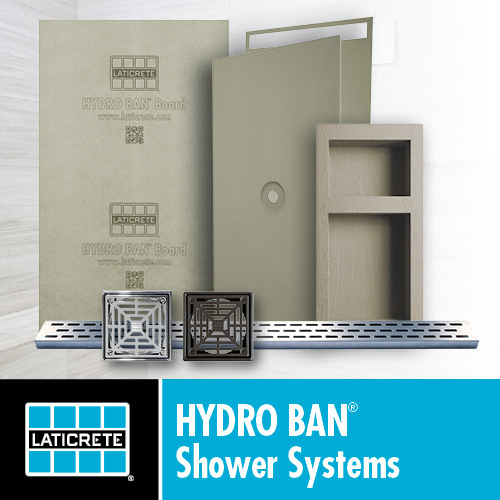 The "shower construction info" thread shows what I'm talking about. That thread is in the "liberry" (dark blue bar above). That's a very good question that I can't answer but will certainly ask. I did send a message to BuildersDepot where I got the tile and they said that they should have sealed the tile before it was grouted since it was natural stone. They also mentioned it could be issue with thinset vs. mastic. I noticed in my bedroom where they have all their supplies the bag of Versabond is white but is says not for stone. Will have lots of questions for GC come Monday. Sealed or not discoloration is likely with that tile. Versabond is what I would call builder's grade thinset. It isn't bottom of the barrel but its far from quality material in my opinion. The bigger issue would be if they had used grey instead of white, that would have really shown. Can you explain further when you are talking about the shower membrane being most alarming over curb. What I mean is where the liner goes over the curb. There should be corner piece that gets put on the corner and flashes up the wall. I'm fairly certain that yours doesn't have that. It's one of the most common places for a shower to leak. This is an example of the corner and some more information. Your correct. I never saw one of those like when I would go in to take pictures after they would leave at night. There are so many things wrong with the tile work that the GC's sub did in the entire bathroom. Its so disappointing. You trust that GC who was very highly recommended would bring in professionals and to have the entire job be a complete train wreak. The extra marble tile that I soaked overnight remained in its original state - white and did not turn gray. So leads me to believe something to do with the shower pan or thinset as you all have mentioned. This should be brought up from the tile contractor and at the tile store where the tile was selected from the very beginning. Then you know there's a chance the color could change.